Lily's Stevia Chocolate Bars Review and Giveaway and Endorpohin Bracelet Winner!! Have you ever heard of Lily's sweets? They make delicious Dark Chocolate bars that are sweetened with all-natural Stevia, the only natural sweetener with 0 calories. Lily's founders, Cynthia Tice and Chuck Genuardi, have a long history in the Natural Foods Industry working in retailing, manufacturing, and consulting. So they had long been aware of the ad­vantages of stevia as the only all natural, no calorie sweetener available today. As admitted chocoholics, Cynthia and Chuck were determined to come up with a delicious, healthy, sugar free alter­native to their favorite treat. And after years spent working on a formula, they created Lily's. Who is Lily? Lily’s Sweets was named after a brave little girl who has beaten the odds and has a big heart! When Lily was 7 years old, she was diagnosed with brain cancer. After a long and hard recovery, she was diagnosed with cancer a second time. She beat it again! Then she raised $9,000 to help other cancer kids have access to wheelchairs. Chuck was kind enough to send me all of their flavors to sample and review. Almond, Crispy Rice, Coconut and Original. The first one I tried was the Crispy Rice. It was the perfect amount of rice crispies, and was so good with the dark chocolate! Then I tried the Almond. I love anything with almond's, so I knew I would love this one, and I did! The Coconut and Original were amazing as well. I'd have to say the Coconut was my favorite. Again, just the perfect amount of coconut mixed with the creamy dark chocolate! These are all so good, and I loved that there is no bitterness or aftertaste, and that they have 25% fewer calories than other dark chocolate, with 100% of the indulgence! I can eat them with no guilt! Each serving has less than 1g of sugars, and is fewer than 23 total carbs, most of those being dietary fiber. Lily’s chocolate bars also have a low glycemic index, so they are a good sweet for diabetics or children to enjoy. Another thing I love about them is the company is not only fair trade certified, but they also donate a percentage of all their proceeds to cancer research. You can go here to locate a store near you, or you can also order them on Amazon! 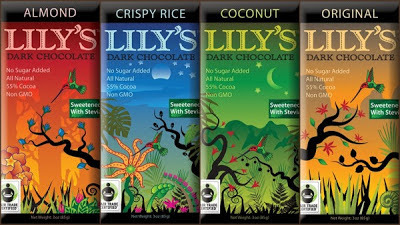 Lily's is offering one of my readers 4 bars, 1 of each flavor! Ends next Tuesday, Dec. 11. Congrats to running in boise for winning the Endorphin Warrior Bracelet Giveaway!! The almond and coconut bars sound delish! I'd love to try the dark chocolate coconut. Or all of them...? These sound SO delicious! I think almond or coconut would be my favorite. How does your family NOT like sweets?!? I have no idea. It's just Hubby and my 2 stepsons. Their side of the family never eats desserts or sweets. It's the craziest thing, and I'll never understand it! It does make it easier on me though! Fun Fact my husband hates sweets too! The Almond and Coconut both sound really good. Coconut and chocolate (especially dark) are two of my favourite things. Dark chocolate coconut chocolate bar?! YUM! the coconut and almond look sooooo yummy! def the almond...that would be my fave for sure! Oh, yum! I would love, love, love to try the coconut! I've never heard of this company- that's awesome that they're also fair trade. Coconut sounds the best to me, but they all sound amazing! Dark chocolate coconut would be my first choice - but I'd love to try them all! Dark Chocolate Almond is my choice! Would love the almond or coconut, who am I kidding... I would love to try them all!!! Love to try that chocolate with Stevia. work and coverage! Keep up the great works guys I've you guys to our blogroll. We had a great experience. From scheduling our service to the work completed we were extremely happy. After explaining our long list of repairs, our appointment was scheduled quickly and our electricians arrived promptly and were very efficient. They knew exactly what to do and brought in all the right equipment to complete all the work in a few hours. They were professional and courteous and we will definitely be recommending American Electric Jacksonville to all of our neighbors and friends. Great experience!